We learned the hard way when we first starting bidding three years ago that not all lot descriptions are what they claim. Sometimes the title and lot description do not jive. Sometimes the designation on the holder is erroneous. In any case, you need to verify what you are bidding on by checking the photo against the lot title and description. If you do, you’ll avoid retractions and bad bids. The above coin is a common 1880-S, misidentified in the title as a rare 1884-S. 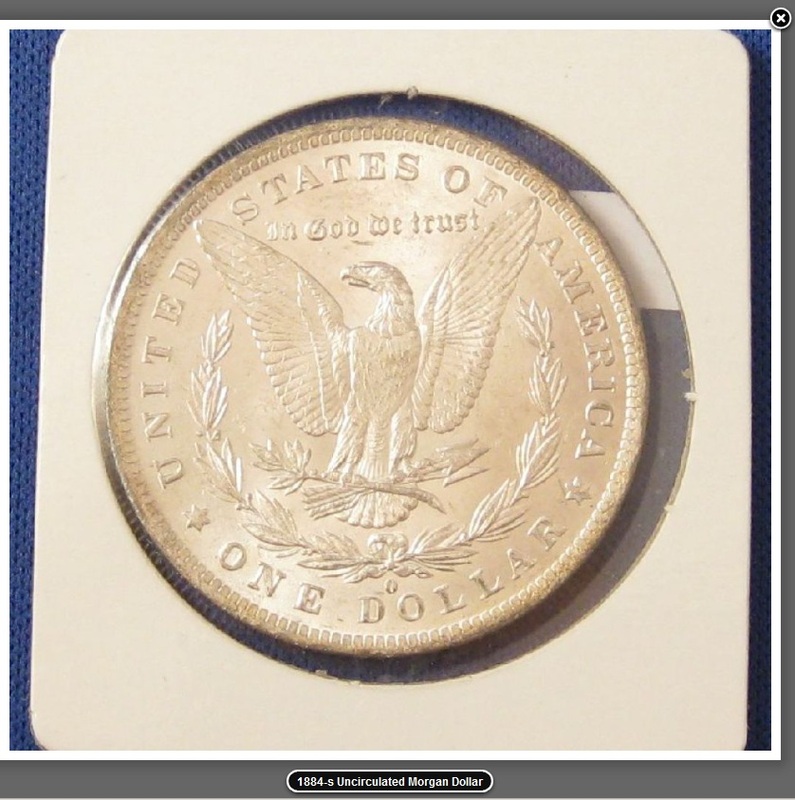 The above coin is a common 1884-O, misidentified again in the description as a rare 1884-S. 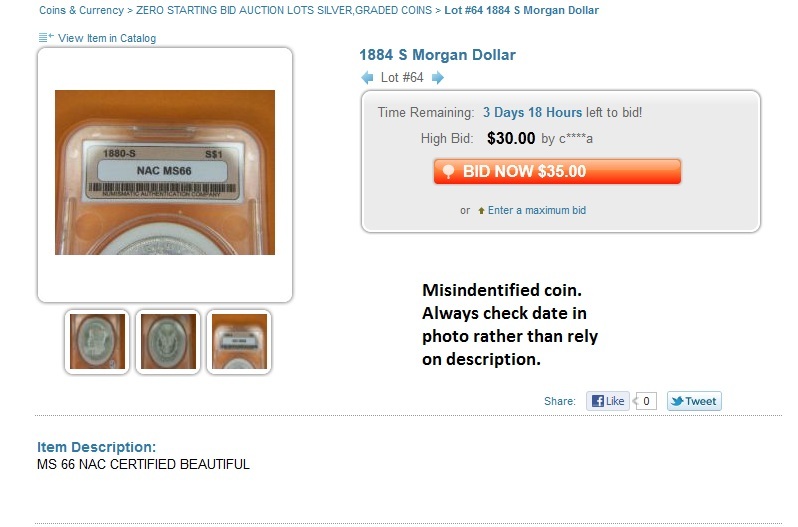 The above coin is a mint state 62, not MS65, coin, misidentified in the title, but bidding continues as if a gem coin. You can use the “Report this Item” link next to the lot to correct an erroneous lot description in the holder, title and/or description. Most auctioneers will be happy you did because you will have saved them trouble with an unhappy, hasty bidder. 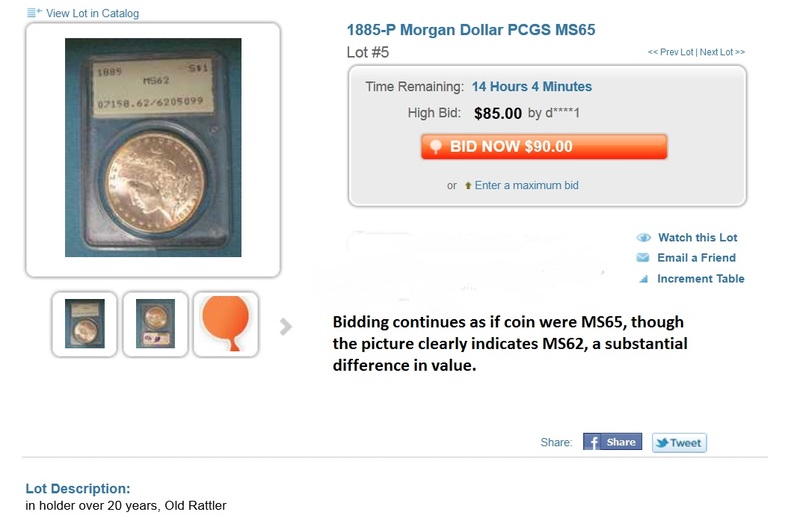 This entry was posted in Best Practices and tagged American Numismatic Association, Auctioneers, Best Practices, Coin Auction, National Auctioneer Association, Proxibid, Proxiblog. Bookmark the permalink.